South-East Advertiser. Our examination of 456 articles from 2007 to 2014 reveals a glut of negative imagery. Urban consolidation is predominantly depicted as dangerous and uncontrollable. Dire warnings abound of a city bursting at the seams and sustained assaults on the Australian suburban dream. declining fortunes in recent times. Their capacity to shape public opinion remains strong. So how do Queensland newspapers heighten the drama of consolidated urban development? And what imagery do they use to sustain the narrative? Cities are rapidly changing all over the world as urban populations grow. Urban consolidation has become a common planning response. It focuses on concentrating growth in existing urban areas. This involves the delivery of higher-density housing and mixed-use developments. Urban consolidation is often advocated as a neat solution to increasing populations, decreasing housing affordability and unsustainable urban sprawl. It is now a key planning policy in many Australian cities, including all of the capitals. 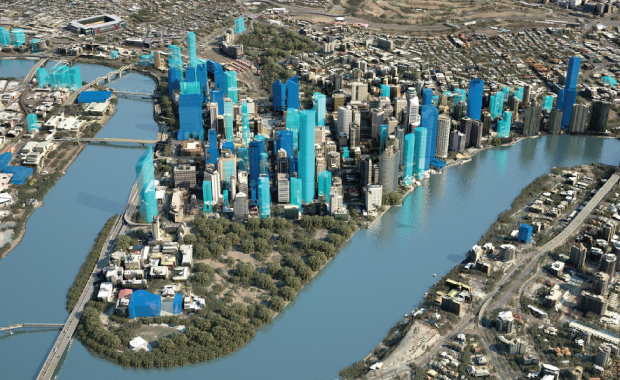 Of the 156,000 additional dwellings forecast to be developed in Brisbane between 2006 and 2031, The South East Queensland Regional Plan has set the goal of delivering 88% in areas targeted for consolidation. The over-arching priority is to accommodate an ever-increasing urban population within existing boundaries. Evidence of implementation in Brisbane can be seen all over the inner city and throughout inner and middle-ring suburbs. Apartment and unit development projects are proceeding at pace. This is leading to a huge upswing in approvals and new stock coming to market. Media reports predominantly capture the drama of consolidated development with references to warfare or natural disasters. Articles commonly refer to floods of development or a city under siege. Local politicians opposed to consolidation are characterised as saviours of the people. These white knights stand strong, benignly offering their constituents protection from the destruction of over-development. Dramatic physiological language is used in articles discussing high-density apartment buildings. Such places are characterised as choking the city or ripping the heart out of its suburbs. Increasing urban densities are presented as threatening the overall health of the city. Apartments are depicted as “shoeboxes”, “rabbit hutches” and “charmless chunks of brick”. The people who choose to live in them are routinely portrayed as outsiders. They are the unwelcome intruders who are taking over the city and corrupting traditional suburban values. By contrast, articles featuring direct quotes from developers and planners tend to use more moderate imagery. Consolidation is portrayed more commonly as a means to create quality places to “live, work and play”. Associated images are usually consumption-based and focus on the benefits of access to inner-city employment and amenities. While some imagery depicting cosmopolitan lifestyles finds traction, it is regularly offset by images of the declining suburban dream. Usually this involves images of the “real Australians” whose happy suburban lives are threatened by over-development. These rarefied beings live on a median wage and host friendly barbecues in a suburb near you. Their depiction is far removed from that of their inner-city counterparts sipping lattes and swirling expensive wine. Our research suggests Queensland newspapers create a sense of danger around urban consolidation in Brisbane. They perpetuate mostly negative imagery, referencing war, death and disease. Increased urban density becomes associated with towering buildings, faceless residents and unhealthy places. Yet this isn’t necessarily the reality. Urban consolidation in Brisbane occurs as a result of managed planning processes. It is designed to meet the city’s current and future development needs. Developments generally occur in accordance with zoning regulations and development plans. Newspapers have a tradition of sensationalising and simplifying news stories. And depictions of urban consolidation in Brisbane do tend towards sensationalism. The drama of consolidated development appears to work well to fill column inches and sell papers. We argue that the use of negative imagery in Queensland newspapers relies more on subjective judgements than facts. Visions of unplanned, laissez-faire urban consolidation subsuming Brisbane are generally at odds with reality. Is the adage of not letting facts get in the way of a good story ringing true once more?